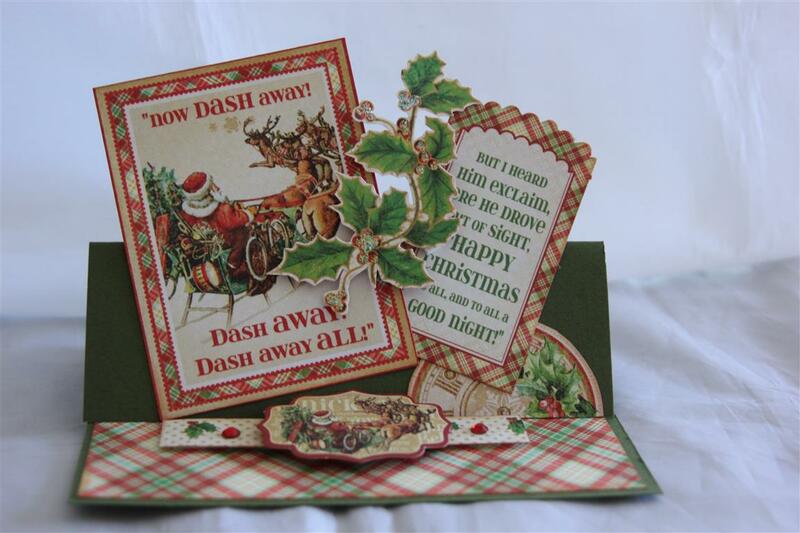 here we go – the last 4 Christmas cards for this year! 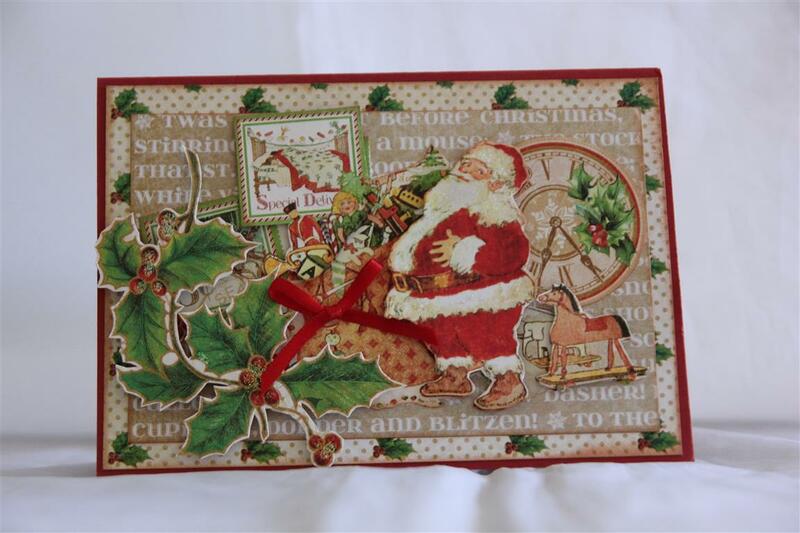 This is graphic 45 12 days of Christmas paper collection – it was last years release I think, but I had a bit left over and made these four cards with it. All stampin up cardstock, and mainly all fussy cutting, with the odd ribbon, doily,lace and punched edge and leaves.I taught a class over at rhe retirement village this afternoon, and have been experimenting in the craft room with some fancy folded cards – I would like to do a class with them, but have to perfect this technique myself first!Til tomorrow…. Graphic 45 T’was the night before Christmas 3,4,5. 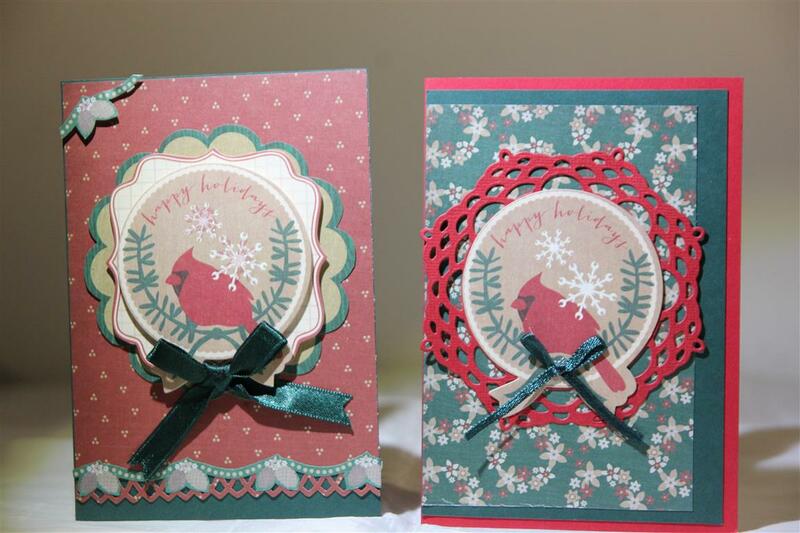 Three more cards made with graphic 45 T’was the night before Christmas paper collection. these have all been made with family members in mind, and tonight I must write them all out and get them in the post!No more embellishing other than kindyglitz and a ribbon bow needed with this paper ( and of course some fussy cutting!) Til tomorrow…. 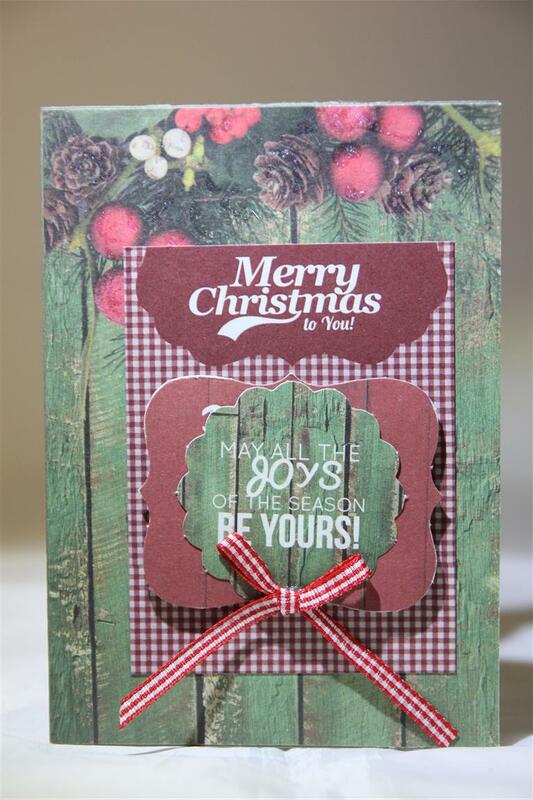 I have so many cards waiting to be shown, but we have to return to Christmas otherwise Christmas will be over! 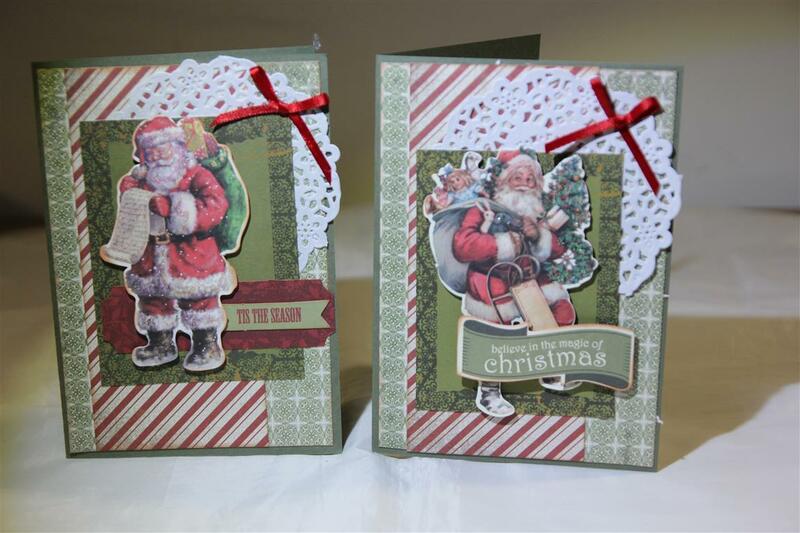 So, for a few days I will flood my blog with all things Christmas, and then we will put them all behind us for another year and move on to all the other paper collections I have been playing with! 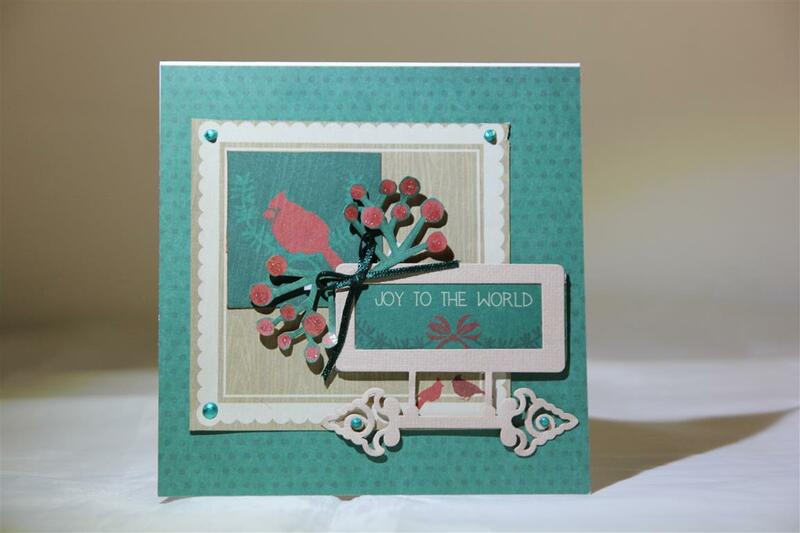 To start, Graphic 45 T’was the night before Christmas paper collection, just one tonight because I want to spend a little time explaining how I made this very simple easel card. I made a 14 x14 cm card base with some red cardstock, and just folded the front of the card into the centre fold. 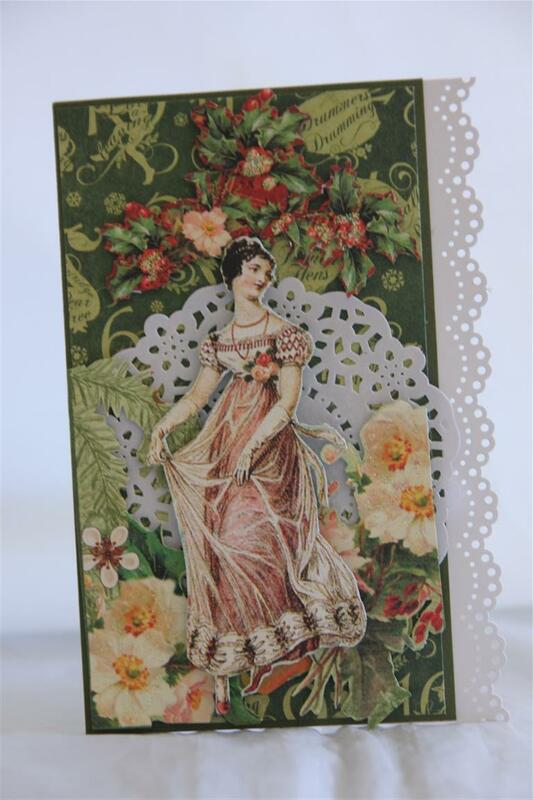 thats it – so easy, but the best way to showcase this image which I fussy cut from a 12 x 12 paper from the collection. I did a little more fussy cutting to make the front stoppers, and the holly frame,covered the base with more patterned paper,and added a strip of lace, bow,and kindyglitz.Til tomorrow…. 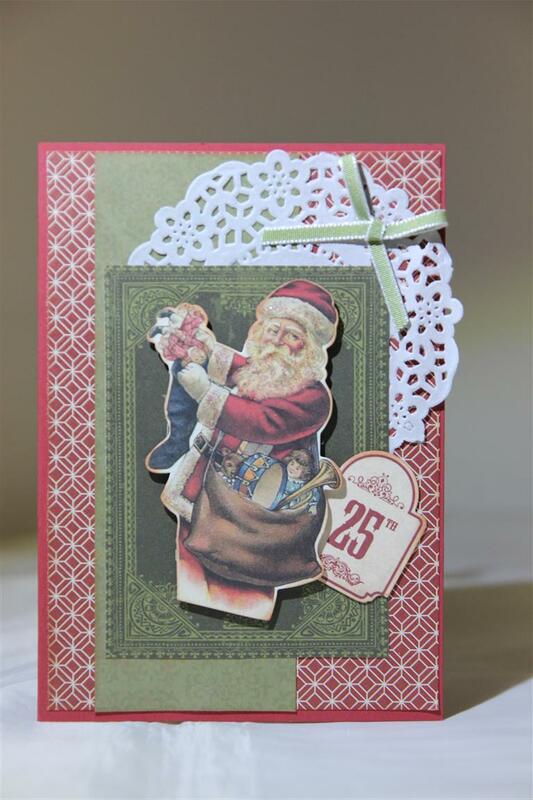 kaisercraft yuletide 19,20 and 21 .. the last.. 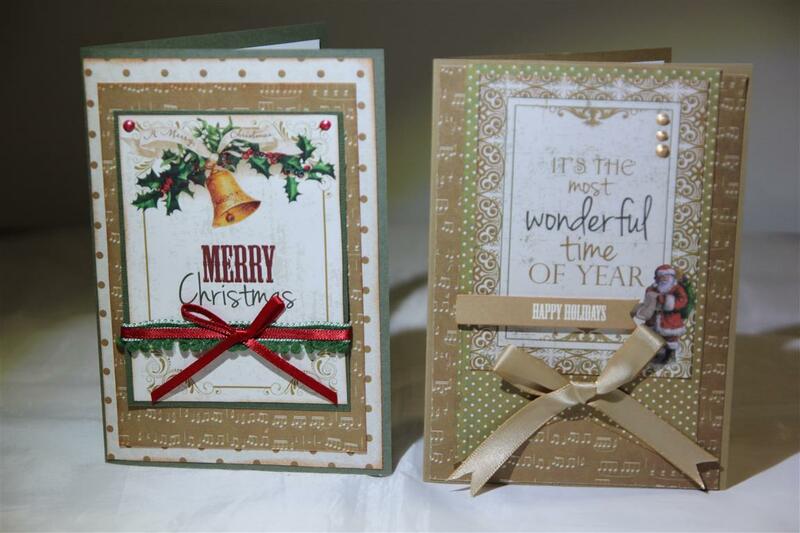 Here are the final three Christmas cards made using Kaisercraft Yuletide collection. 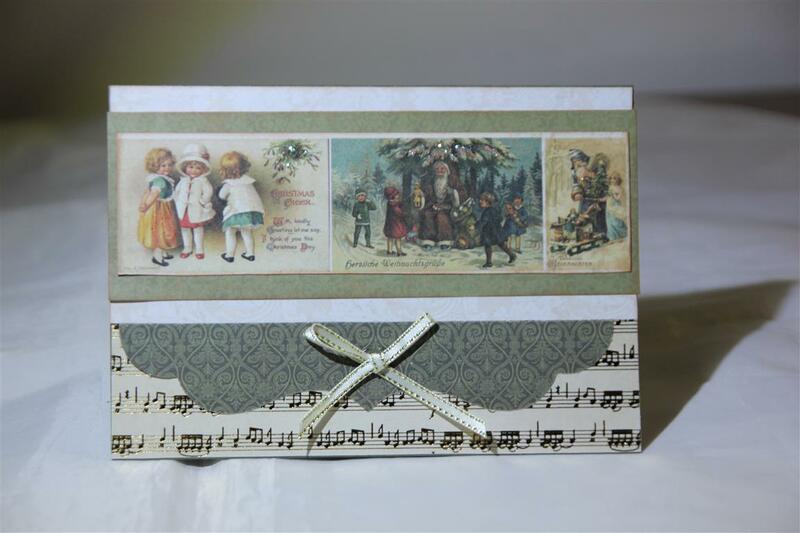 these three are all made using the 6″ pad, with just some ribbon and liquid pearls to embellish. ( The second one also uses some holly pieces from the collectables of the same collection). 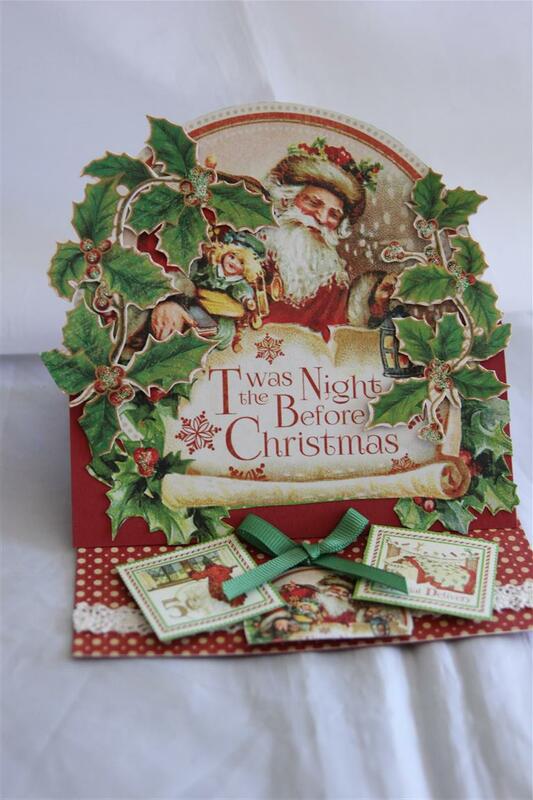 I have enjoyed creating my cards with this paper, but its time to finally move on and tomorrow we will have totally different non – christmas cards! Today I have spent a couple of hours in the craft room – it’s super warm here today ( read Hot) so not a day for too much moving around, the craft room is the best place to be. Til tomorrow…. 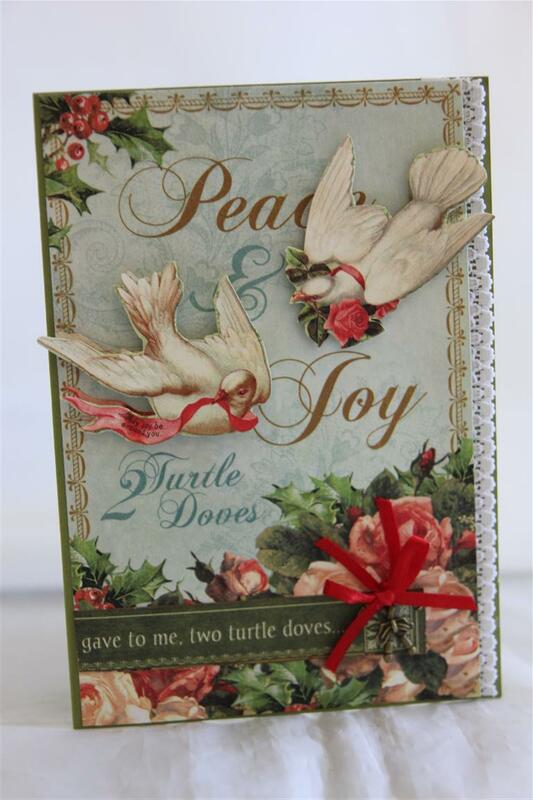 Kaisercraft Yuletide collection – the 6″ pad and matching collectables for the main part, and for the top three cards the addition of doilies and ribbon but the same sketch design for each. 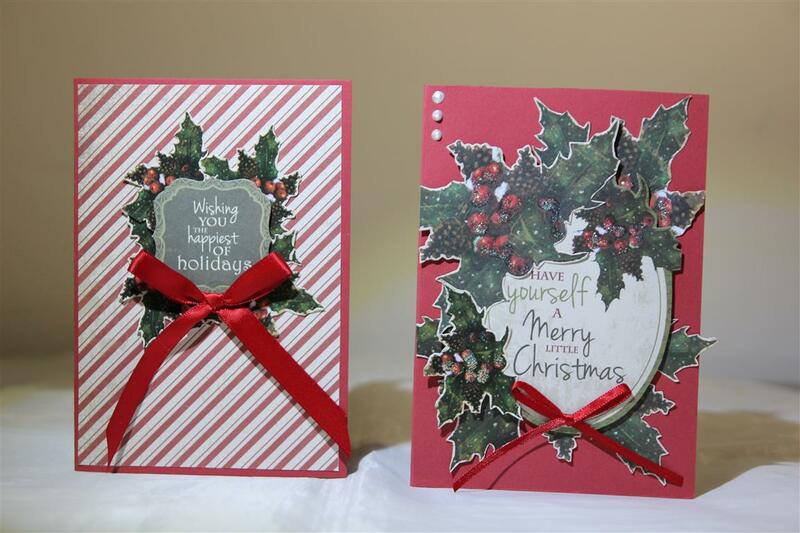 the bottom two cards rely more on fussy cutting the holly from both the 6″ paperand the 12″ papers.one more post left with this paper, and then we will move onto some new papers that i have been playing with. Speaking of which, I taught a class today, and picked up some new bo bunny papers which I look forward to sitting with tonight and cutting out bits and pieces! til tomorrow…. 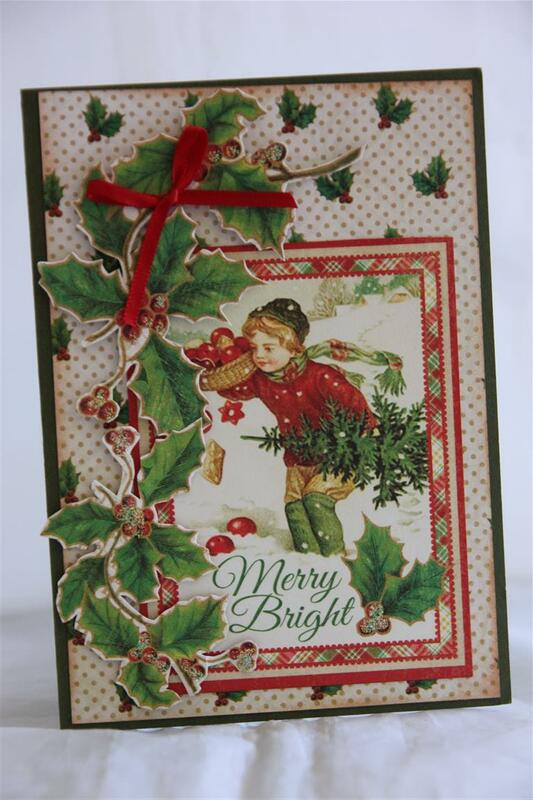 Back to kaisercraft Yuletide collection today, and the top cards are made with the 6″ pad and little ribbon bows. 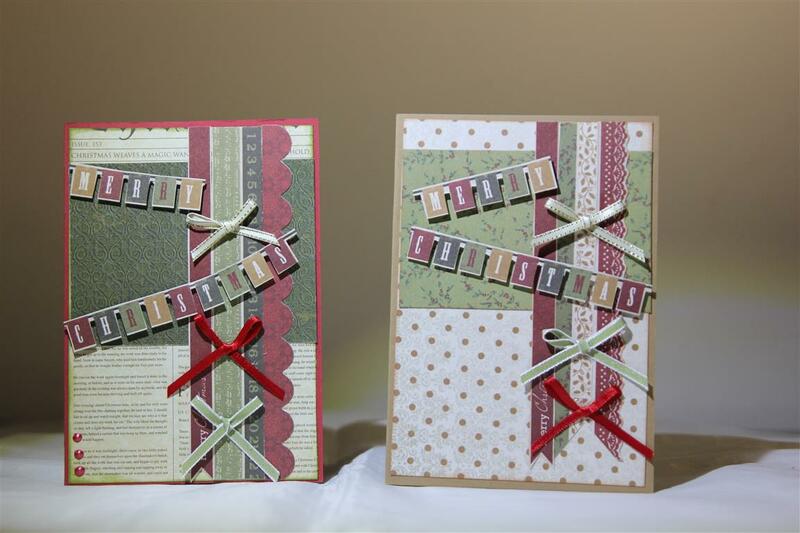 The bottom two cards are made with the 12 x 12 ” pad , some ribbon trim and liquid pearls, and lots of layering.Cardstock is stampin up. Quick post this morning as it’s off to work I go1 til tomorrow….. 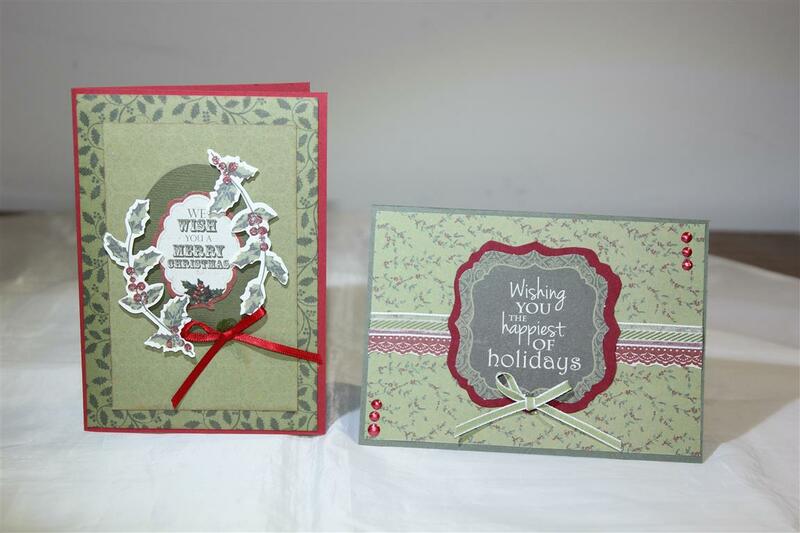 The top card is the last Card I made ( for now) using Kaisercraft basecoat christmas, and the bottom three are made using last years kaisercraft collection called Holly bright.Top card is straight forward with some layering of matching collectables and the addition of a ribbon bow,. 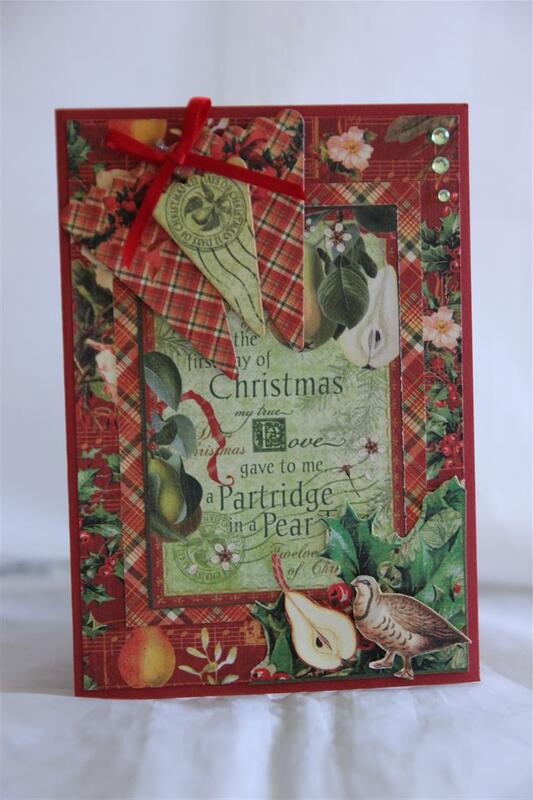 The bottom three were made with bits and pieces I had left over, so I added some die cuts and punched borders to stretch the collection a little bit further.This weekend my crafting time has been spent making my personal Christmas cards. I have been using graphic 45 Twas the night before Christmas, and also The twelve days of christmas, which is a previous years collection and I am trying to use it all up. Next weekend I will get nathan to photo them before I write them out and send them off! Til tomorrow…..